Born in Gloucestershire in the early 1490s, William Tyndale studied at Oxford, where his Bachelor's degree was awarded on 4 July 1512, and three years later, on 2 July 1515, he received his Masters. On 24 March 1515 Tyndale was ordained a deacon in St Paul's Cathedral and on 7 April 1515 he was ordained priest in the church of the hospital of St Thomas Acon the martyr, in the City of London. After spending a number of years studying in Oxford, Tyndale began further study at Cambridge. Tyndale returned to his native Gloucestershire in 1521 and spent two years as tutor to the children of Sir John and Lady Walsh at Little Sodbury Manor. It was here that he began to translate the New Testament. Many clergy enjoyed the hospitality at Little Sodbury Manor and Tyndale would debate theology with them. When on one occasion, Tyndale's quoting of the Word of God irritated a friar, who said: 'We had better be without God's laws than the Pope's. Tyndale replied: I defy the Pope and all his laws; and if God spare my life I will, before many years have passed, cause the boy that driveth the plough to know more of the Scriptures than you do. Tyndale had come to the conclusion that: 'It is impossible to establish the lay people in any truth, except the Scriptures be plainly laid before their eyes in their mother tongue'. Tyndale's views and his preaching in the area around Bristol brought him to the attention of the Chancellor of the Bishop of Worcester, who ordered Tyndale to appear before him, and warned him about his conduct. Soon after, Tyndale visited a friend of his, a retired priest who had formerly been archchancellor to a bishop. He warned Tyndale: 'Do you not know that the pope is very antichrist, whom the scripture speaketh of? But beware what you say: for if you shall be perceived to hold that opinion, it will cost you your life'. The opposition to Tyndale and his preaching, caused him to move to London, where he had hoped that Tonstall, the Bishop of London, who had been praised by Erasmus for his learning, would welcome him to his Bishop's Palace and allow him to translate the New Testament into English. The Bishop turned Tyndale away, but after hearing Tyndale preach at St Dunstan's Church, a wealthy merchant named Humphrey Monmouth, invited Tyndale to live and work in his home. Here for six months Tyndale, along with John Frith, worked on translating the Greek New Testament into English. However, a further period of persecution began in London and Tyndale wrote: 'I understood at the last not only that there was no room in my Lord of London's Palace to translate the Scriptures, but also that there was no place to do it in all England'. Tyndale boarded a ship going to Hamburg, and he never saw England again. In Hamburg, Tyndale continued with his work and by late 1524 had completed the translation of the Gospels of Matthew and Mark. He left Hamburg and spent some time in Wittemberg, before travelling to Cologne in spring 1525. Here he visited a printer, and ordered 3,000 copies of the New Testament. However, the authorities became aware of Tyndale's order, and he had to rush to the printers, collect the sheets that had been printed and escape down the Rhine. He moved to Worms, where he met with another printer, and the printing of the first two editions of the English New Testament was completed by the end of 1525 when 1,500 copies were ready. By the end of 1526, six thousand Testaments were printed and ready to be sent into England. The English authorities were watching every port to ensure that the Testaments would not come into the country. The Testaments were packed into cases, barrels, and bales of merchandise, and sacks of flour and grain, and were smuggled into England. In four years 15,000 copies were distributed throughout the country. By late August 1526, the flow of Tyndale Testaments into England was so great that an emergency meeting of bishops was held to address the problem. At the end of October 1526 Tunstall, Bishop of London, issued a proclamation that all copies of the English New Testament were to be confiscated under pain of excommunication and suspicion of heresy. He preached a sermon at St Paul's Cross denouncing the English New Testament, and following his sermon every copy of Tyndale's translation that had been seized was burnt. Cardinal Campeggio wrote from Rome on 21 November that he was pleased to hear of the burning of the sacred codex of the bible, perverted in the vernacular tongue, and brought into the realm by perfidious followers of the abominable Lutheran sect; than which assuredly no holocaust could be more pleasing to Almighty God'. With profits to be made from the sale of English New Testaments, pirate copies were printed in Antwerp and began arriving in England in November 1526. To stop the spread of Tyndale's Testament, Archbishop Warham began buying any copy he could acquire and burning them. Tyndale used the funds to pay for the printing of a revised edition. From Worms, Tyndale moved to Marburg and then spent two years 1533-35 in Antwerp. Here he was betrayed and arrested and spent sixteen months in prison in Vilvorde Castle. On 6 October 1536 he was strangled at the stake and then burnt. His final words were 'Lord, open the King of England's eyes'. Within two years of his death, King Henry VIII issued a proclamation to place a Bible in the English language in every parish church. One biographer of Tyndale ends his account with this assessment: 'William Tyndale first gave to England what the nation has never yet lost, the English New Testament in print. The work of Tyndale that first issued from the printshop at Worms and was smuggled into England just four hundred and fifty years ago, is now read by millions throughout the English speaking world. 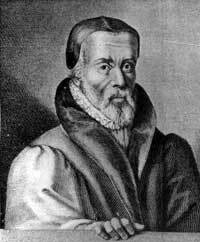 But, typical of the man who hid himself away that his Lord might be exalted, his work comes within the covers of the Authorised Version of King James ... We can honour Tyndale's memory in no greater way than by taking those same Scriptures as our only guide into the truth of God's way of Salvation, and that will honour Tyndale's God'.